Sleep is a great, complicated thing. Best medicine. Did I mention that sleep is great? Sleep hygiene refers to the habits you develop to maintain healthy sleeping patterns in order to ensure that you consistently get enough quality sleep. Unfortunately, many modern adults have terrible sleep hygiene. Hectic work schedules, high stress levels, and the omnipresence of technology all contribute to the negative sleep habits, low-quality rest, and drained energy levels that plague millions. Developing healthier sleep habits can transform how energetic, joyful, and health you feel on a daily basis. Improving your sleep hygiene doesn’t require you to quit your job, get rid of all your stress, or go off the grid. In fact, making a few minor lifestyle adjustments can lead to major improvements in the amount and quality of sleep you get every night. One of the biggest culprits of insomnia and low-quality sleep is stress. When you feel sad, angry, or worried about stressors in your life at bedtime, it’s almost impossible for you to fall asleep. 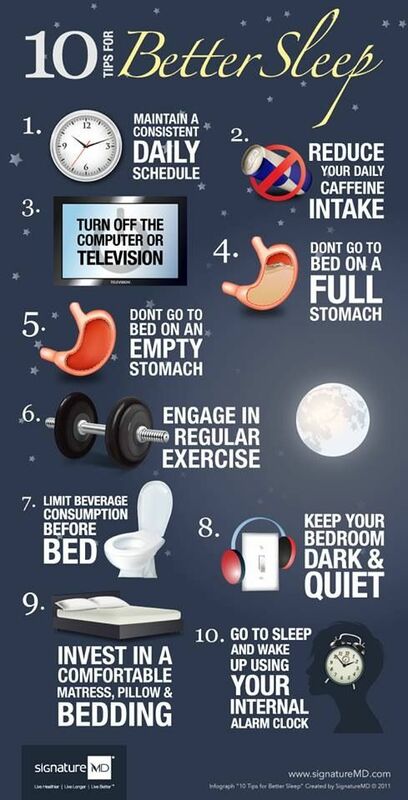 Getting rid of your daily stress before you go to bed isn’t realistic for most people. You can distract yourself from feelings of stress and other negative emotions by developing a nightly positive thinking routine. Start with five to ten minutes of meditation at bedtime to clear your mind and drive stressful thoughts out of your head. Right before you turn off your light, jot down three things you feel thankful for in a gratitude journal. This simple, quick activity will help automatically reroute your brain toward more peaceful, positive thinking patterns that allow you to fall asleep more quickly and easily. Most people know that restricting your caffeine intake past a certain time of day is essential to sleeping well at night. A lesser known substance that interferes with your sleep is alcohol. Alcohol is a depressant, which means reasonable amounts make you feel slightly sleepy. You might even notice that you feel more relaxed and fall asleep more easily after you drink a glass or two of wine before you go to bed. It is true that it can be easier to fall asleep more quickly with some alcohol in your system. A few hours after you consume it, though, alcohol turns into a stimulant. If you’re asleep at this point, the alcohol in your system causes lighter sleep and frequent wake-ups that leave you with less energy the next day. You can still drink your nightly glass of wine at dinner or when you get home from work. Just try not to consume any alcohol within two to three hours before you go to bed to keep it from disrupting the quality of your sleep. Everyone who has ever had any trouble sleeping knows the torturous feeling of tossing and turning for hours, trying to fall asleep at bedtime or fall back to sleep in the middle of the night. The stress and frustration of laying awake in bed unable to sleep only increases your alertness and decreases your chances of getting any quality sleep. Don’t let yourself toss and turn for more than twenty to thirty minutes. If you can’t fall asleep within half an hour, don’t succumb to panic or frustration. Turn on a dim light and engage in a no-stress, mindless activity like making and drinking a cup of tea or hanging up stray clothes that you’ve thrown on the floor and have yet to put away. Do NOT turn on any of your electronics. After fifteen to thirty minutes of this activity, turn the lights back off and try to fall asleep again. Many working women who hold down jobs with a standard 9-5 schedule maintain a very irregular sleep schedule. If you work in the morning and get home in the evening, you probably end up waking up and going to sleep early Monday through Friday and then staying up later and sleeping in on Saturday and Sunday. You might think that you’re doing your body good and catching up on sleep when you sleep late on weekends. In reality, you’re just confusing your body’s natural sleep cycle and lowering the quality of your sleep. This doesn’t mean you have to wake up at 5 am on the weekend like you would to make your early morning commute on weekdays. Just nix sleeping till noon and try to wake up within an hour or two of the same time no matter what day it is. You’ve probably noticed that you’re able to fall asleep more quickly, stay asleep, and feel more rested the next day if you’ve gone on a hike or run errands all day. When you move your body and get moderate exercise during the day, the quality of your sleep at night greatly improves. If you sit in an office all day and then come home to sit at your laptop or in front of the TV until you move to your bed, your sedentary lifestyle is probably contributing to any sleep problems you may have. Exercising releases the cortisol hormone, which makes you feel more energetic initially but helps you relax and get higher-quality sleep at night. Try to fit in thirty minutes to one hour of daily exercise at least three to four hours before you go to bed to improve your sleep without disrupting it with the boost of energy exercising gives you. At this point, it’s fairly common knowledge that you should try to avoid staring at your smartphone or laptop screen for at least an hour before you go to bed. However, the amount of time you spend staring at a screen during the day can also disrupt your sleep at night. If you work on a computer all day long, make sure to look away from your screen for at least five minutes every hour. These short, frequent tech breaks help prevent your eyes from getting tired from the harsh LED lights lack of blinking that make it more difficult to fall asleep and stay asleep at night. More sleep is always better, but sometimes it isn’t realistic. If you commit to developing better sleep hygiene and a stable sleep schedule, you can reduce the amount of sleep you get without disturbing your energy levels. Start by establishing a strict sleep schedule and stick to it for at least a week. Then, start waking up ten minutes earlier in the morning. Stick with that new schedule for a week, and start shifting your bedtime and wake-up time by ten minutes every week until you’re sleeping up to an hour less every night without feeling any more tired during the day. Sleep is definitely something to take seriously. Getting enough, high-quality sleep on a regular basis is essential for maintaining your physical and mental health. All it takes is a few simple tweaks in your daily habits and lifestyle to improve your sleep hygiene and boost your health, happiness, and energy.